Western's Allison Lindley guards the inbounds pass from Concordia's Annalissa Kammeyer in the IHSAA Class 3A North Semi-State at Warsaw. WARSAW – Some things just aren’t meant to be. Last Saturday in the Tiger Den at Warsaw Community High School was one of those days for the Western Lady Panthers basketball team. Playing in its first Final Four and the Class 3A North Semi-State, Western dug a first half hole it could not overcome en route to a 46-35 loss to No. 7-ranked Fort Wayne Concordia Lutheran High School. 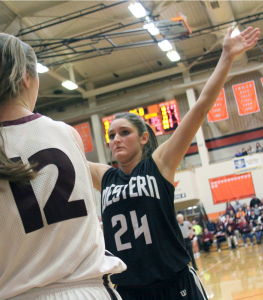 Western started strong as they took a 2-0 lead on an Amber Fernung basket on an assist from Nicole Rogers. Unfortunately, it would be the Panthers only lead of the game. While the Panthers held the Cadets to seven points below its scoring average, a nine minute scoring outage in the first half was too much to overcome. Western’s only other first quarter basket came from Rogers five minutes into the game as the Panthers trailed 12-5 after one. By the time Western scored at the 2:34 mark of the second, Concordia was on a 15-0 run and seemed to have the game in hand. The intermission scoreboard read Concordia 25, Western 10. What was up the sleeve was Rogers, who should have sealed her spot on the Indiana All-Star team with a 17 point third quarter that put the Panthers back in the hunt. In the middle of a Rogers 17-4 run on Concordia, she became the second leading scorer in girls Howard County hoops history. In what will go down as one of the best single-quarter individual efforts in Western basketball history, the IUPUI recruit hit four 3-pointers, a driving basket and a three-point play. She single-handedly cut the large Concordia lead to 29-27 before the Cadets called a pair of timeouts to adjust with three minutes left in the third stanza. Keisling was quick to point out that Rogers does not have that type of effort if not for her teammates picking up their game as well. Unfortunately, the rally drained an already low tank for Western, and they could not get past the seven-point deficit in the fourth quarter as the Cadets hit 9 of 11 free throws in the second half to seal the victory. Western only hit 12 of 38 shots in the game. But there were silver-linings as they won the turnover battle (16-12) and had more steals (11 to 5) as they held the Cadets to 46 points – the squads fourth-lowest in a win. Rogers finished her Western career with a 23 point, six rebound performance for a total of 1,593 career points – second only to Kokomo legend Tiffany Longworth in county history. Caitlyn O’Neal scored seven off the bench and twin sister Carley led the team in assists (4) and steals (3). Despite the loss, Keisling was thrilled with the way his first season went, and he said he was very proud of the team. Western finishes its season with a school record tying 19 wins (19-6) and memories that will last a lifetime. Concordia (20-5) was led by the 14 points of Lauren Marinko and now advances to the state finals in Terre Haute next Saturday. They will play the south semi-state winner and second-ranked Mount Vernon of Fortville (23-5). This entry was posted in Basketball, High School, IHSAA, Rogers, Tournament, Western. Bookmark the permalink.